Are you the kind of person who likes to have fluffy, foamy cream with your latte, cappuccino or hot chocolate? 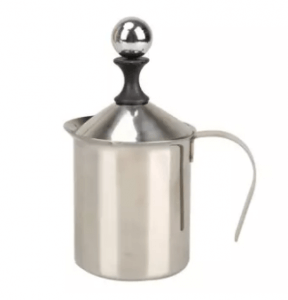 You can thank milk frothers, also known as milk foamers, for providing you the ability to whip milk into the perfect frothy consistency to put into your favorite hot drinks, making your coffees and hot chocolates creamy and indulgent. You can get frothy drinks in cafes and coffee shops, but you can buy your own milk frother and make your own frothy drink at home whenever you want instead. Today we’ll be checking out our list of the top 10 best milk frothers available to buy online, but not before taking note of what to consider before buying one. There are two different kinds of frothers, electric and manual, and both can be further classified into different types depending on their form. Some frothers are better suited for different kinds of milk or cream and drinks than others, so choose which kind you need wisely. As the name suggests, electric frothers are frothers that are powered by electricity. They can either be plugged into an electrical socket, or run on batteries. Since they are powered by electricity, you don’t have to exert much effort or muscle in order to get results. Just simply press a button, and the frother will whisk away the milk to the consistency that you like. There are two different kinds of electric frothers–the “electric stick” type and the “fully automatic” type. Both have different results and benefits, so let’s take a closer look at them. 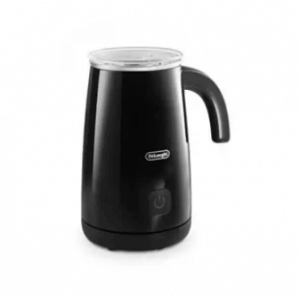 With its upright shape, this kind of electric frother is meant to be held in your hand. The whisk is usually made of small, coiled springs, and is located at the end of the thin, long metal shaft attached to the holder. You typically place the whisk on the top of your cup, at the milk on top of your drink, and then push the button to whisk the milk into a foam. This kind of frother is very common in stores, making it easily accessible to the public. Some electric stick frothers may come with their own special cup. This kind of frother is easy to use and easy to wash and can be used for either cold or hot milk. However, when used on large quantities of thick milk or cream, the whisk isn’t very powerful and will only foam it partially, leaving the rest of the milk or cream runny and liquid. It’s only recommended to use electric stick frothers, especially smaller ones, on drinks with small quantities of milk. Because of this, it is best suited to be used for hot drinks between two to three people. 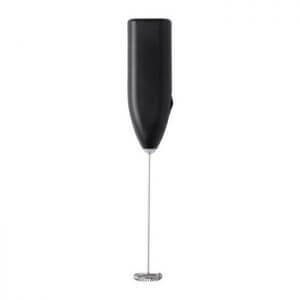 The fully automatic type of electric frother is more like a small mixer with a heating function. You simply put the milk inside of it, and turn on a switch; the frother automatically heats and whisks the milk to a thick, foamy consistency. You can froth up a lot of milk in a minute or so using a fully automatic electric frother. Since you can froth up more milk with this than with an electric stick type, this is ideal to use at gatherings with a group of people, like at a business meeting or a family reunion. Manual frothers do not need electricity or batteries to be used. Instead, you have to use your manpower to be able to froth your milk with them. If you don’t mind exerting a bit of effort, or like to hustle the muscles in your arms and hands while making your milk foam, then these frothers might be good to have. Mesh type manual frothers are usually stainless steel or glass containers with a hand pump or press covering the top. Put some warm milk inside the container, cover the top and then push the pump or press up and down repeatedly, until the milk inside becomes thick and foamy. When used with hot milk, the constant pumping action of this kind of manual frother creates a thick, elastic milk foam that won’t collapse easily. This results in a very rich, creamy drink. Of course, mesh type milk frothers can be used with cold milk as well, but the resulting foam won’t be as thick and elastic as with hot milk. Shaker-type manual frothers are best used for cold milk. 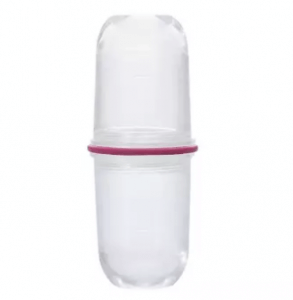 It’s similar to shakers used by bartenders in bars – the cold milk is placed inside of it, then it is shut tight and shaken back and forth repeatedly. The result of shaking is a smooth, frothy milk. While it’s not quite as stable as the results of the other types of frothers, the milk froth is nonetheless great for putting into homemade lattes, making them tastier and creamier to drink. Since all you really have to do is shake the milk inside, anyone and everyone can use a shaker type frother. You can even ask your children to help you out and watch them have fun shaking it to their hearts’ content! While shaker type frothers are best used for cold milk, you can still warm the resulting milk froth by heating it in the microwave after shaking. The results of the use of your frother highly depend on the temperature of the milk you’re going to use with it. 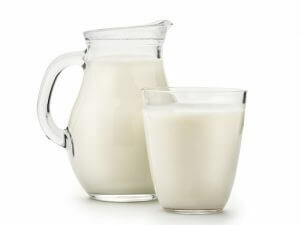 Depending on the product and the type, some frothers work best with hot or warm milk; others work best with cold milk, and some are able to work with both. Before purchasing a frother, you have to be sure that its features paired with the kind of milk you’re going to use will give you the results you want. Take note of the type, functions, and characteristics of your frother before making your choice. You should also be mindful of the recipes of the drinks you plan to make using a frother, as the temperature of the milk may vary depending on the drink. 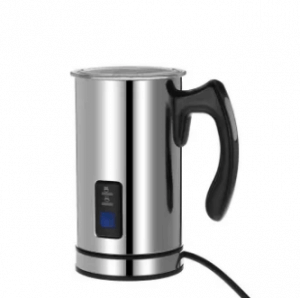 Now it’s time for us to recommend to you our top ten choices for the best milk frothers to buy online. We’ve ranked each recommended product based on their prices, functions, and the resulting milk froth that they put out. Remember to keep the tips we gave you in mind earlier while browsing for the perfect frother for you! 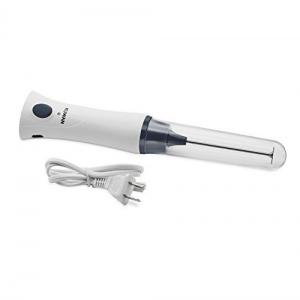 This electric stick type frother runs on batteries and comes with two detachable whisks. 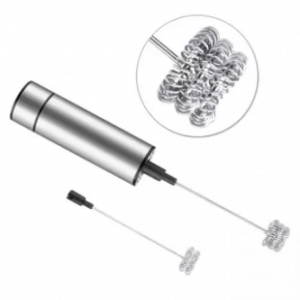 Most electric stick frothers usually only have one spring for the whisk, but this frother’s detachable whisks are made of two springs and three springs, respectively. The double spring and triple spring whisks speed the frothing process, providing you with fluffy milk foam faster than electric stick frothers with only one spring. It’s a good deal for people who want a quick cup of frothy coffee or cappuccino every once in a while. 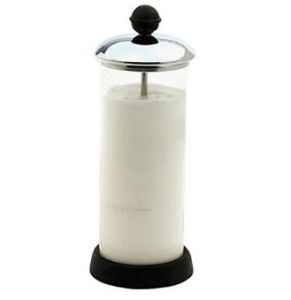 This manual frother can be used with hot milk or cold milk, as well as non-fat milk and cream. It produces an airy, long-lasting milk froth that makes hot drinks taste smoother and lighter. The container is made of glass, so you can see for yourself how well the frother froths the milk as you pump it. If you want to use a manual frother that allows you to see the results immediately, this one could be perfect for you. This shaker type milk frother comes from Japan. Simply put cold milk inside of it – it is not recommended to use hot milk – and shake it back and forth with all of your strength. The harder you shake, the frothier the milk becomes. Because of the easy shaking motion, this milk frother can be fun to use. If you have children at home, this would be perfect to get them to help you make the fluffy milk froth by letting them do the shaking, which will allow them to have fun “playing” with their food. If you’ve been looking not only for a frother but an egg beater and/or a cocktail mixer, look no further! 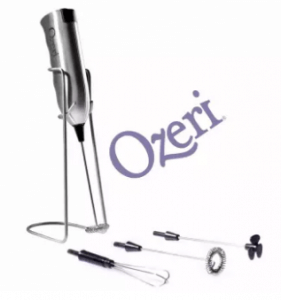 This battery-powered stick frother comes with four different attachments: two whisks for frothing milk, one whisk for beating eggs and one small propeller for mixing cocktail drinks. 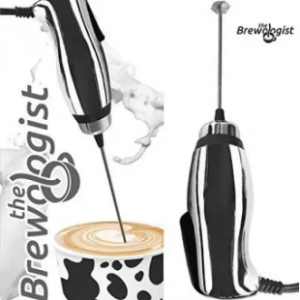 With all these different attachments with different functions for a low price, this would be a handy tool for anyone to have around in the kitchen, and not just for frothing milk for your morning coffee. The most notable feature of this stainless steel manual frother is the two discs of fine mesh attached to the bottom of the press. When the frother is pumped, the milk passes through both fine mesh discs, making the resulting milk froth twice as thick and foamy. The pitcher-like design of the brother, with its drip-resistant spout, makes it easy to pour the foam into your coffee or latte cup. While simple in function, this kind of manual frother is a classic and a good deal for those wanting a reliable option. Unlike most electric stick type frothers, his chrome-coated electric stick milk frother doesn’t run on batteries. Instead, it has an electrical cord attached to it and is powered through the cord when it’s plugged in. Because it doesn’t need batteries, this milk frother can be used for however long you want as long as it’s plugged into an outlet. It could be very useful if you need to whip up a lot of frappes and other hot drinks for a party or gathering, or in a café or coffee shop. This electric stick type milk frother has an inbuilt battery that recharges when plugged into an outlet through its detachable cord. You don’t need to buy separate batteries for it, and you can use it whether it’s plugged in or not. Keeping it plugged in lets you use it for as long as you want, but you can also use it without electricity when it’s fully charged. This would be great to use for people who want to froth their hot drinks outdoors, or who simply want to save money and electricity. 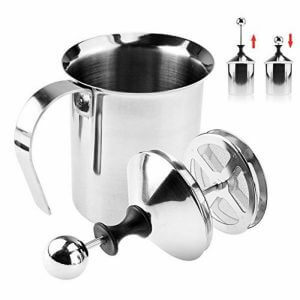 This stainless steel electric frother has two main functions: to froth milk and to heat up milk. There are separate whisks for frothing and heating milk, and you’d have to change the whisks to switch between functions. You can use either hot or cold milk, and you can make either hot or cold froth. If there are people in your house that don’t like your frothy hot drinks and just want hot milk, this would be helpful for providing the best of both worlds. This automatic electric frother also froths and heats milk, with two discs for (hot and cold) frothing and one disc for heating. The stand has three simple buttons for cold, hot and warm froth options to make different types of milk froth for whatever you need. The frother’s pitcher is covered all over with a scratch-free, non-stick coating, making it easy to clean. 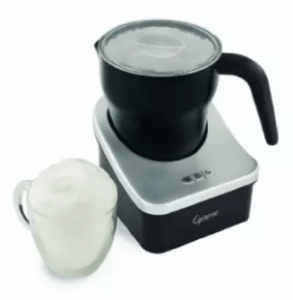 This is ideal for anyone who wants to try out different kinds of milk froth for all sorts of things like hot drinks and cold desserts, and who want the easy interface and cleaning that it provides. Different kinds of milk frothers will have different effects on how milk is foamed, and this depends on the temperature of the milk that you’re going to use as well. Keep in mind the kind of drinks you’re going to make and the sort of texture you want in them so that you’ll be able to pick out the best frother for your needs. Happy drinking!